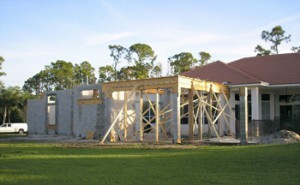 Will We Be Able To Stay In Our House While The Addition Or Remodel Is Being Built? Before hiring any home improvement contractor, think about the answer you get to this question. While every room addition is different, I have never needed the homeowners to move out during construction of their project. Sure, if the entire interior had to be redesigned for wheelchair access or a second floor is to be built over existing living area, you will probably have to move out. If the garage is being converted into living space, the car(s) may need to be kept outside and a new place found for all your stuff. If the HVAC system has to be relocated or the ductwork added to, there may be a period of time when you have no air conditioning. If your outdoor shed has to be demolished and it currently houses your water heater, washer, and dryer, you may be without hot water and/or laundry facilities for a while. And… ultimately the project will be completed and after a few weeks of enjoying your new space, any inconveniences will soon be forgotten. If you have questions about adding on to your home or questions about any home improvement or remodeling project, please call me at 561-795-2551 or email me at: todd@leadingedgehomes.com and I’ll be happy to share my knowledge with you.